A couple of weekends ago, we went to Wyoming to visit my parents. We haven't been there in a while, Zoe has a bit of a problem sleeping without her bed, but we had a blast. 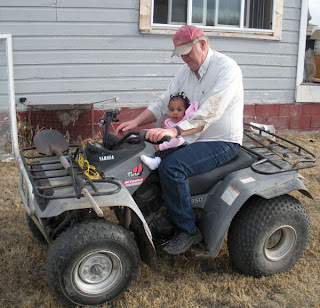 The kids had a lot of fun, especially going outside with Grandpa. They are such city kids. They aren't sure quite what to do when we get out there, where there is room to roam around. Robby's greatest adventure of the weekend was riding a horse. My dad helps out on a cattle ranch across the road from our house. 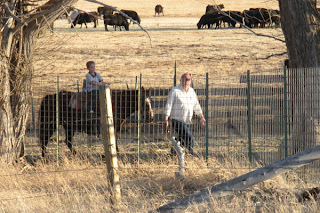 They don't usually have horses there, but every spring, when it is time for the calves to be born, they bring horses to help out with the work. 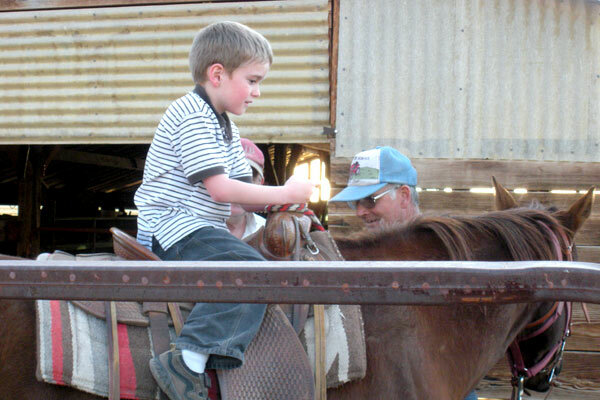 Every year, we have asked Robby if he wanted to go ride and every year he has been too scared to do it. I understand, a horse is a pretty big animal and if you aren't around them much, they are definitely scary. This year though, he didn't even hesitate; he knew he wanted to do it. You can see the look of pure terror on his face here. He knew he wanted to ride, but actually getting on the horse was a little nerve racking. It wasn't long though before he was completely comfortable. He even rode with no hands for a while. He was so excited. I love watching him experience new things. The light that shines in his eyes when he accomplishes something new is one of the most beautiful things in the world. Unfortunately, it got a little cold and Zoe didn't get a chance to ride the horse. She did get to go on her first 4 wheeler ride with grandpa though. They just rode around the yard a few times, but she seemed to enjoy it. Every time they would come around the side of the house and she could see us, she would get a big huge grin on her face. It was great. I am so thankful for my parents and the love they show my kids. Robby and Zoe have a blast every time they are around.